Ceramic tile grout holiday cleaning, Frisco? You are days away from Christmas. The in-laws and family are coming to your house for the holidays. With the big rush to gather the gifts, clean the house, prepared on what to cook. Maybe even cleaned the carpet, but have you stopped to see what your tile and grout look like? If not, may want to check. Are your grout lines turning darker, maybe even getting to the point of where some areas are looking black? If this is the case then you may want to consider having your tile and grout professionally cleaned. I know your thinking, why would i want to professionally clean my tile when i can clean it myself? Because it’s Christmas and you have far more better things to worry about. Do you really want to break out the good old fashion tooth brush, grab some kind of cleaner, get on your hands and knees, just to scrub your tile days before Christmas? This will not only take forever to clean, but will stress out your knees and back. You could be in pain for days. The more tile you have the longer this will take, not to mention using a cleaner and not have enough pressure to rinse the cleaner out of the grout will attract more dirt at a faster rate. So what might have got clean will not last long. Now remember, we are now days before Christmas. Do you really want to take a chance wearing the holiday spirit out of you physically before Christmas. I’d have to say no. Now if you hire a professional, know that they have the proper equipment to do the right. Not only that, but they won’t be using toothbrushes. A professional knows the latest methods in the industry to get your tile and grout cleaned in a timely manner. What might have took you days, would take them hours. Depending on how much tile you have which will also give you a better clean. Show your in-laws and family members that you are very detailed when it comes to having a clean home and remember impressions matter. If your tile and grout is dirty it will be noticed. By professionally cleaning the tile and grout. You can have the luster returned to your tiles, and have the dirty grout looking as new as the first day it was installed. 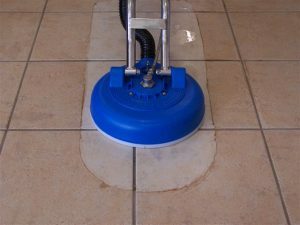 With the latest cleaning methods and the extensive process that most professionals use, your tile will be returned to it’s beauty in the matter of hours. Then to seal the deal, add a sealer to protect the grout. Why seal the grout? Because the grout is very porous and once cleaned, all that nasty in the grout would be removed, leaving the grout vulnerable to take in dirt, accidental drink and food spills, and anything else that falls into the grout. Some drink spills once spilled onto non-sealed grout could be permanent, so beware. A sealer will protect your newly cleaned investment. So why clean your tile every year, when you can seal your grout and only have to then clean it every 3 to 5 years. That little bit extra you pay to seal the grout will save you so much money.